I love how the beads change colors when the light is on. It goes well with several different colors in a room. My 11yr old daughter loves it! 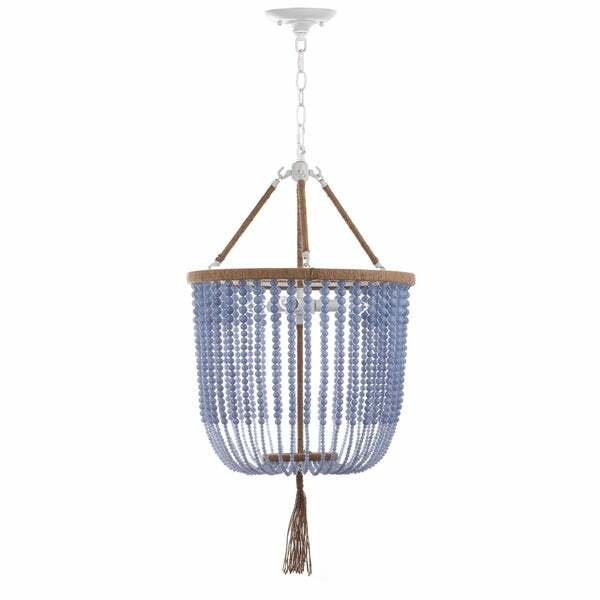 Inspired by the handcrafted vessels in Budapest's top luxury hotels, this adjustable 3-light blue beaded pendant lamp radiates Bohemian-chic style. This pendant's posh strands create informal elegance, and the design is an ideal choice for any contemporary or transitional decor. Made with acrylic beads, this pendant is as much of an artful statement piece as it is a functional piece of lighting. Its luxe tassel gives the finishing touch to its free-spirited vibe. Ideal for any taste, this piece is a designer must-have. Care Instructions: Before cleaning any lamp shade or fixture, disconnect the power source. Wipe with a soft, dry cloth. Avoid the use of chemicals and household cleaners as they may damage the finish. Dimensions 107.5 in. H.x 18 in. W.x 18 in. D.
Absolutely love this pendant light!! It’s hung in our dining room in our house near the beach. It gives just the right amount of beachy without being “cottage”. I like it so much I would buy another just in case I find a place to put it! As other reviews stated, it does come with a long chain if you need it; we shorted ours and it looks amazing over the dining table. i just love everything about this light fixture. the beads, the rope accent and the dangling tassel sealed the deal! so unique and the perfect price point! Looks wonderful in my breakfast nook! Great Price and great quality! I love the color as well. I would highly recommend this lovely pendant! Love this and the value for the money! Looks cheap. They used plastic instead of metal where the light bulbs are. The value is great if you don't mind that. I put it in a bathroom and it glammed it up. Fantastic fixture! Looks wonderful and very expensive. Beautiful chandelier! The color is just as pictured and it is pretty big in size. I had planned to hang it in my daughters room. Unfortunately, it was a little big for the room so I had to return. Great look for the right price!